The more personalized offers you send the bigger chances to increase your sales. And if you decrease the time spend on the offers or even let the client generate the quotes online by itself, this business management software 100% custom developed can really boost your sales! how can I decrease the time spend for preparing and sending an offer ? can I see the offers send by my sales agents ? can I see every time the status of the offers send by the sales agents ? if a sales agent is leaving the company can I allocate the offers to another one ? can the clients request for automated quotes ? can I have different discount levels for my clients ? how will my agents be informed about the marketing promotions inside the company ? 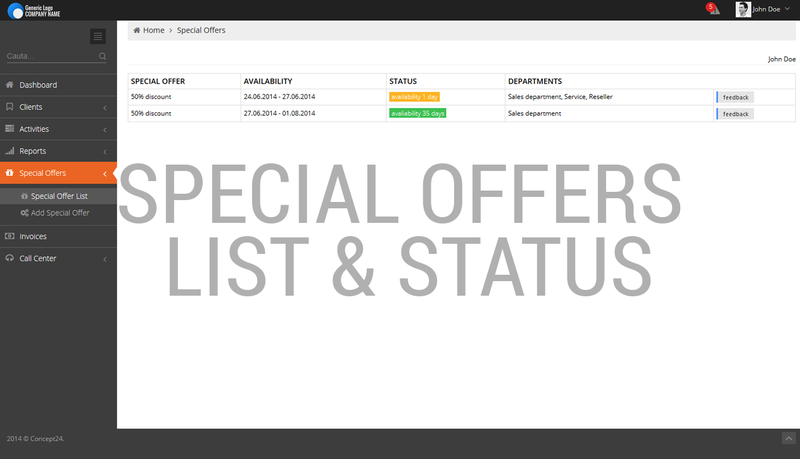 can the clients be automatically informed about special offers ? 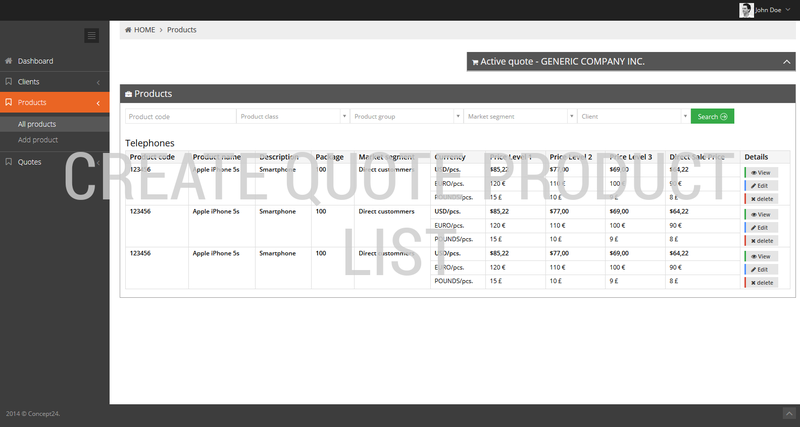 Based on your product database, the users can easily create quotes directly from the application we develop. If your current quoting procedure takes too long, we can decrease the time of up to 2 minutes. The products in the offer can be added from the website or from the application. Pictures, descriptions and all product information are added automatically to the offer. Your offers can be done at the discount levels you established with every client. You only have to add the client name or email address and the system will allocate the price level you previously configured. You will be able to follow the offers sent by the company employees and their status. You will get a detailed overview on how many offers are on course, won or lost, and why. It will be a great tool to analyze the efficiency of the sales department. If a sales agent is leaving the company you can allocate the offers to another one. CLICK on the pictures below for SCREENSHOTS from our quoting software! 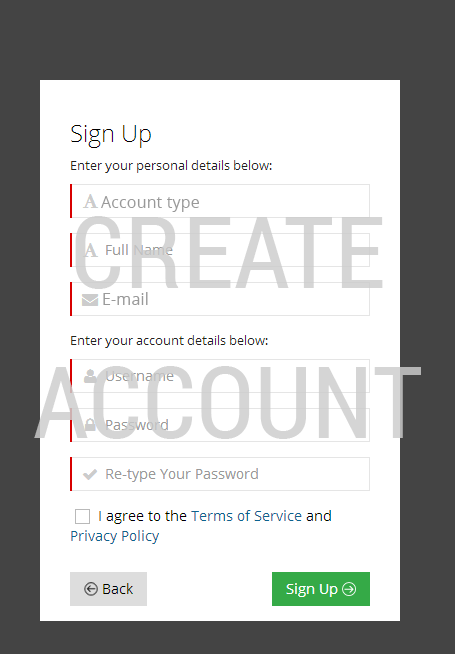 You can create accounts for your clients, that will allow them the access your product lists. Each client will only see the information suitable for him and the price range you subscribed him for. 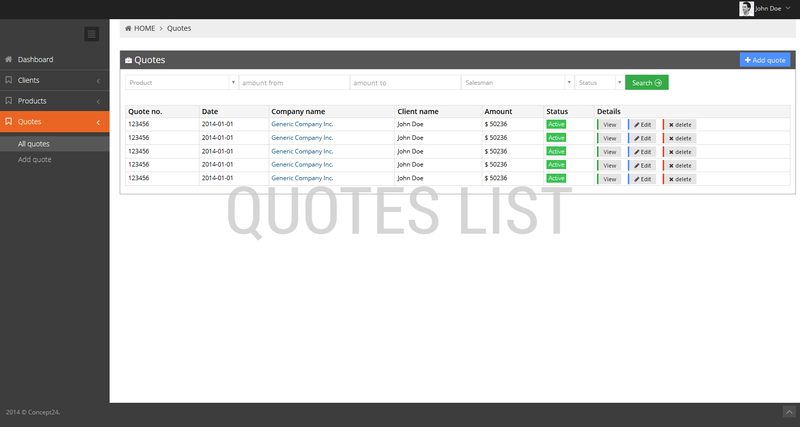 So instead of requesting offers from your sales agents, the clients can make quotes by themselves, from a highly usable product list. A great deal of time economy for you and for the client. 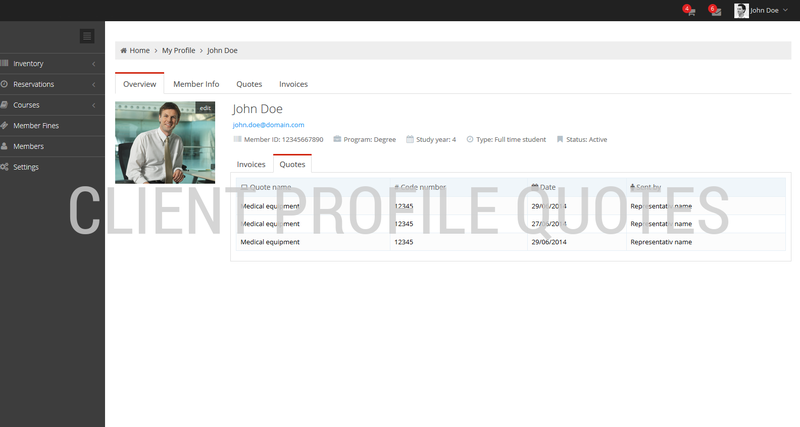 Each client can access the initiated quotes and see the status of the quote (e.g. received, on analysis, accepted, sent). If the app is synced with a courier application, the products may be already on their way if on stock. CLICK on the pictures below for SCREENSHOTS ! 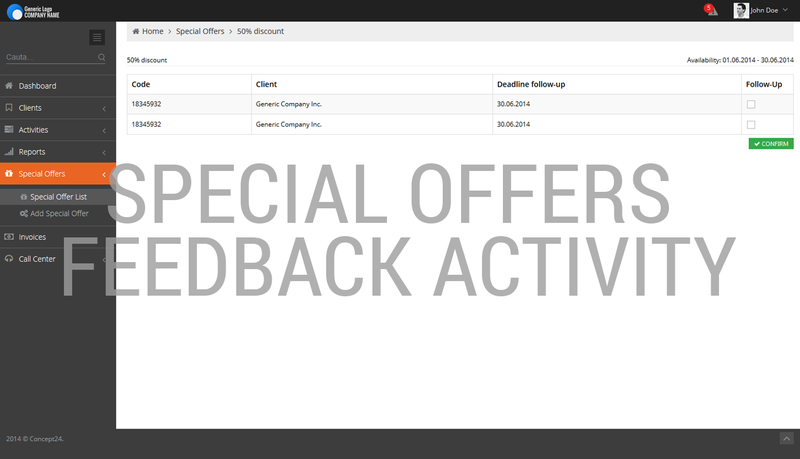 Your salesmen and clients have to be informed as soon as possible regarding the new special offers in your company. The marketing responsible can add special offers, either described simply, either having a whole catalogue of products as part of your campaign. The clients will be informed by email and, if you grant them access, they can order the products directly from the application or from the site the application is synced with. 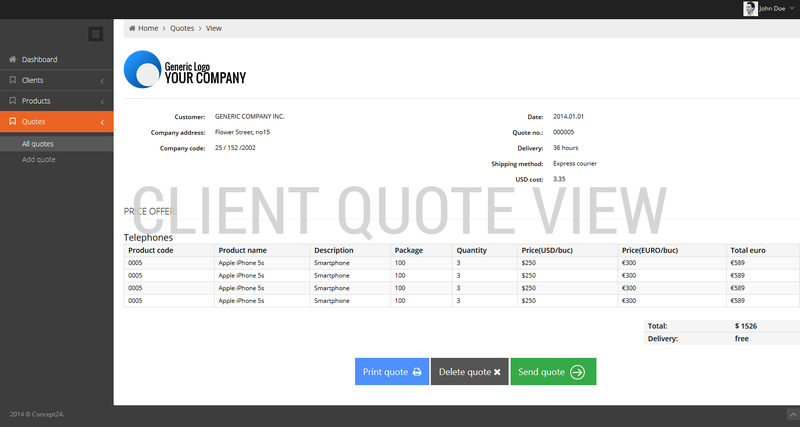 Your salesmen will also be informed by email and application internal notification and they can easily add the products on special offers to quotes sent to their client portfolio. This kind of module allows instant access to the special offers information from both ends of your business. You go cross-country or worldwide with your special offer in a matter of minutes – all the users involved will know about it. Any dedicated REPORTS can be created for the top management or the application users. 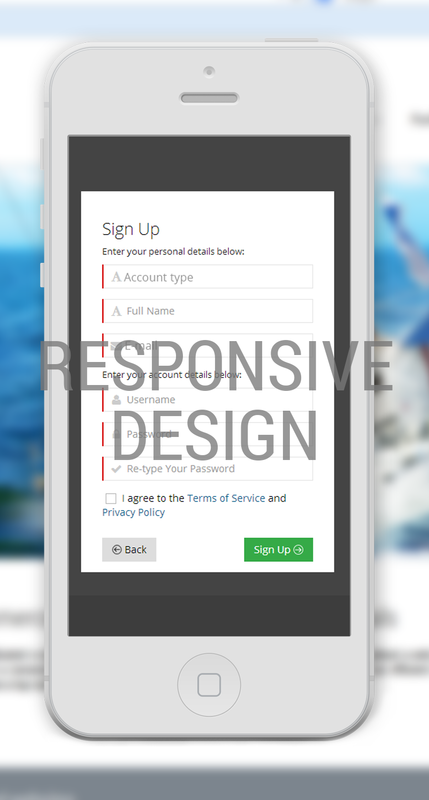 Building a custom web based software is the best choice. It will perfectly fit your business ! Don't hesitate to contact us for a free quote. Send us a brief description of your project and we will get back to you with our technical proposal and a budget estimation. Does one of you business partners need our solution ? Share it or send it per email!